The south end of the Red Line is now officially closed for rebuilding. The project is supposed to take five months. Many Chicagoans are reminded of the Green Line renovation of the 1990s, when service was suspended for nearly two years. 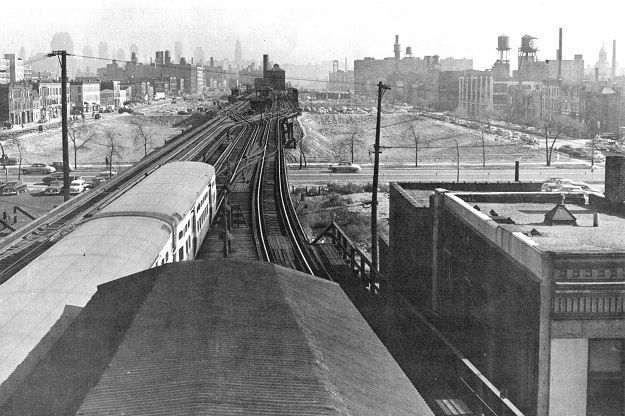 However, if we want to talk about the biggest Chicago ‘L’ rebuild, we have to go back to the 1950s. Sixty years ago, the Garfield Park ‘L’ was one of the city’s major transit carriers. 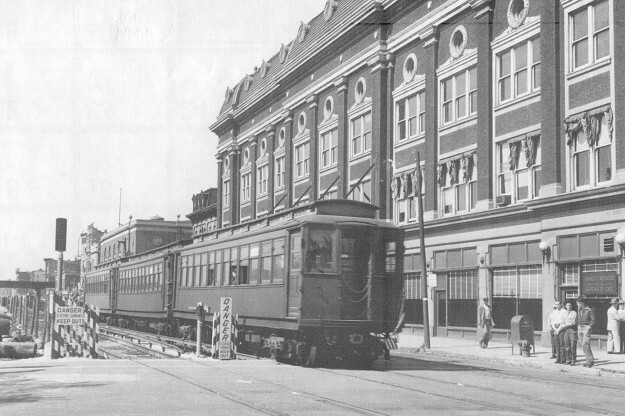 Trains ran west from the Loop along the general line of Van Buren Street to a terminal in Forest Park. The ‘L’ tracks were also used by the Chicago, Aurora & Elgin electric interurban line. In 1953 the city began clearing land for the new Congress (Eisenhower) Expressway. Plans called for both ‘L’ and interurban trains to operate in the median of the completed highway. In the meantime, part of the Garfield Park ‘L’ was in the way, and would have to be torn down. The expressway project was going to take years. CTA might have shut down Garfield Park service for the duration and told riders to take the Lake Street ‘L’. Instead, a temporary elevated structure was to be erected along Van Buren Street. Local aldermen objected. The temporary ‘L’ would be ugly, and probably unsafe. A compromise was reached. Garfield Park trains were rerouted along Van Buren Street—but on the ground. The Van Buren bypass opened on September 20, 1953. Trains ran at street-level between Aberdeen and Sacramento, about two-and-a-half miles. The tracks were fenced-in, with crossing gates at each intersection, and took up most of the street. Only a single lane was left open for west-bound auto traffic. Garfield Park trains did not make passenger stops along Van Buren. However, they were forced to halt for red lights like ordinary street traffic. This made the ride slow. Many patrons moved over to the Lake Street line, or simply switched to their cars. Meanwhile, Chicago, Aurora and Elgin service into the city was cut back. Their trains now operated only as far east as Forest Park, where riders had to change to Garfield Park trains. Patronage fell off rapidly, and the interurban went out of business in 1957. On June 22, 1958 ‘L’ trains began operating on the expressway median as the new Congress line. The remaining structures of the old Garfield Park line were demolished. And after five years, the automobile reclaimed all of Van Buren Street.